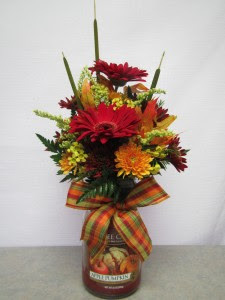 Yankee Candle Arrangement for Fall Local Delivery Only in Elyria, OH - PUFFER'S FLORAL SHOPPE, INC.
Puffer's Floral Special: Our cheerful Yankee Candle Arrangement is perfect for birthdays, anniversarys, or any occasion! We offer a variety of seasonal scents and we can match the arrangement to the candle. Makes the perfect two-in-one gift. 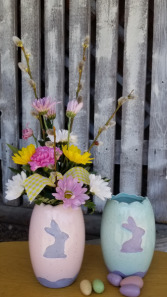 Beautiful Easter arrangement of mixed spring long lasting flowers. 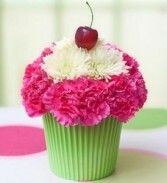 Adorable assortment of carnations with a cherry on top!!! Perfect for birthdays and special surprises! 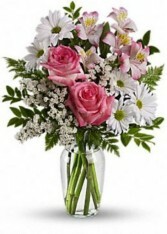 Teleflora's "What a Treat" Bouquet is a perfect combination of pink roses and white daisies and pink alstromeria.